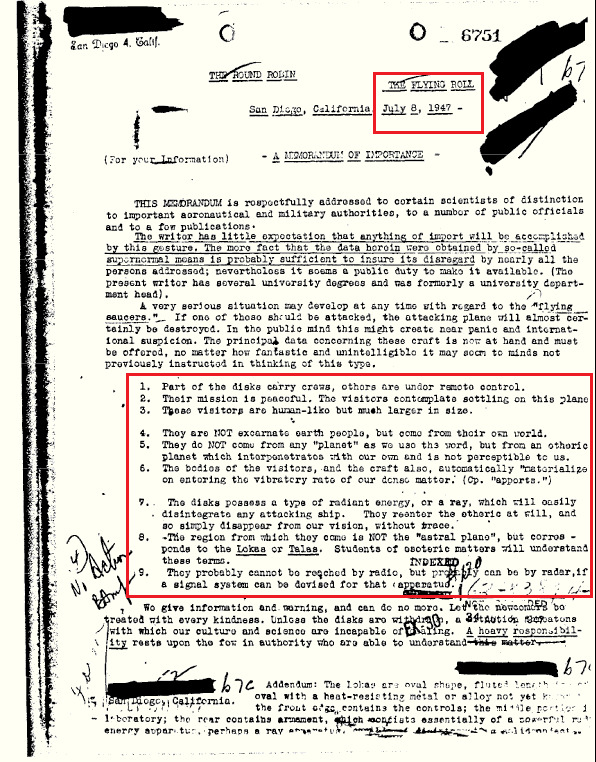 FBI documents: We've been visited by 'beings from another dimension' - The Meta-Center | Chicago - Over 43 Years of Metaphysical Teaching! Part of the disks carry crews, others are under remote control. Their mission is peaceful. The visitors contemplate settling on this plane. These visitors are human-like but much larger in size. They are not excarnate Earth people but come from their own world. They do NOT come from a planet as we use the word, but from an etheric planet which interpenetrates with our own and is not perceptible to us. The bodies of the visitors, and the craft, automatically materialize on entering the vibratory rate of our dense matter. The disks possess a type of radiant energy or a ray, which will easily disintegrate any attacking ship. They reenter the etheric at will, and so simply disappear from our vision, without a trace. The region from which they come is not the “astral plane”, but corresponds to the Lokas or Talas. Students of esoteric matters will understand these terms. They probably cannot be reached by radio, but probably can be by radar. if a signal system can be devised for that apparatus. We give information and warning and can do no more. Let the newcomers be treated with every kindness. Unless the disks are with-(illegible) a (illegible, illegible) with which our culture and science are incapable of dealing. A heavy responsibility rests upon the few in authority who are able to understand this matter. Addendum: The Lokas are oval-shaped, fluted length, oval with a heat-resisting metal or alloy not yet known, the front cage contains the controls, the middle portion a laboratory; the rear contains armament, which consists essentially of a powerful energy apparatus, perhaps a ray.